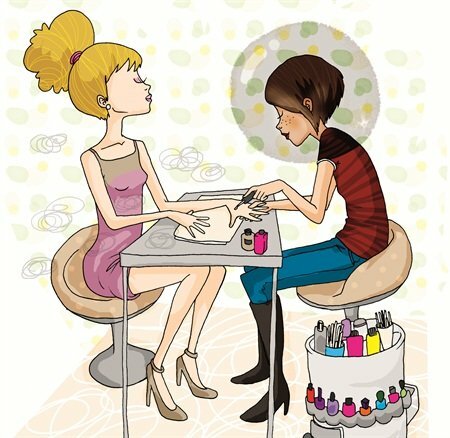 We know there’s a lot to think about when managing a nail salon. From product ordering to fixing a leaky faucet to the crucial art of client booking, sometimes it seems that everything is urgent and that anything that doesn’t require immediate attention is a low priority, no matter how important it may be in the long-run. So we know that it’s easy to ignore the comments of a client or two who complain about the lingering odors in the salon or the dust that is covering your clothing by mid-afternoon. Maybe you even made an attempt at addressing these issues, such as buying a home or office air purifier from the local hardware store. But even with the air purifier, you notice the smell lingers and the dust remains. It’s difficult to make ventilation a priority, especially when you don’t even smell the salon odors anymore and you feel perfectly healthy. Maybe you will remain perfectly healthy for the next 50 years (we certainly hope so! ), but here’s a message from your future self: It would have been so easy to prevent the headaches, the sore throats, the watery eyes, the constant sneezing, and the shortness of breath. All it would have taken would have been a few days of research of contacting a few nail salon ventilation companies (there’s even a list in this article), ordering some equipment and dealing with a one-time hassle of figuring out where to place it in the salon, then doing some simple maintenance every few months (the equivalent of changing a light bulb) to keep the system working. Isn’t that worth a lifetime of breathing easy? “The nail salon is a tough environment,” says Jeff Cardarella, president of salon ventilation manufacturer Aerovex Systems. “The vapors and the dust are similar to a printing press room. It’s strong industrial solvents you’re working with, and they’re stubborn to remove.” (That’s why a home or office air purifier won’t work in a nail salon.) The vapors come from the products themselves, which you’ve probably noticed when twisting the top off of a new bottle of acetone or acrylic monomer, and the dust comes from filing off enhancements. Even if you can’t see the dust, that doesn’t mean it’s not there. What you can’t see can really hurt you: “When it comes to some of the UV gel products, the dust is so fine that it’s insidious,” says Len Roulier, president of salon ventilation manufacturer Air Impurities Removal Systems Inc. “The UV gel dust just kind of floats up and gets into everything.” It can lodge itself inside your lungs, causing a slew of respiratory and other ailments. So if a salon is such an unpleasant work environment, why aren’t there laws protecting nail techs requiring ventilation systems to be installed in every salon? That’s a complicated question without a great answer. Many different government agencies hold some claim to enforcing clean air requirements in nail salons. However, in many cases, the laws are outdated or simply unenforced. The Occupational Safety and Health Administration (OSHA) requires engineering controls when chemicals in the workplace exceed permissible exposure limits (PELs). However, in nail salons PELs are almost never exceeded. Unfortunately, that doesn’t mean there aren’t potential health effects at concentrations below OSHA PELs. Plus, OSHA doesn’t have established PELs for some of the chemicals used in nail products. The International Mechanical Code (IMC) also addresses ventilation and is the basis for most state-specific mechanical codes (generally enforced by local building departments), so in many places salons must comply with its requirements for construction permits and/or certificates of occupancy. Updated every three years, the IMC has addressed nail salon ventilation since 2006. But, as it was only mentioned in a footnote, many inspectors overlooked it. State cosmetology boards also hold some jurisdiction over salon air quality. However, many boards use vague undefined terms like “adequate” when describing the requirements for a ventilation system, which isn’t really enforceable. Finally, some agencies like public health departments and state boards focus more on the safety of salon clients, not of workers. But clients are only in the salon for about an hour. You’re in the salon the entire day. Though it’s unlikely your salon will face any legal repercussions from insufficient ventilation, there are compelling health reasons to protect yourself and your staff. The vapors and dust of nail products are generated close to your breathing zone and can cause a variety of acute and long-term diseases. When ventilation isn’t sufficient, airborne chemicals build up, increasing your exposure. And simply having the heating-ventilation-air-conditioning (HVAC) system running doesn’t lessen your exposure. “Chemical vapors are usually heavier than regular air, so they settle downward. That means that by the time the vapors get to the ceiling vent, they’ve already gone through your breathing zone,” Roulier says. Several local governments recently started offering incentives for salons to improve their air quality. In November 2010 (and effective from February 2012), San Francisco adopted legislation to create a Healthy Nail Salon Recognition Program by which its Department of the Environment recognizes salons that meet certain parameters including ones that “install mechanical ventilation unit(s) within one year of entering recognition program” and that “allow SFE program staff to monitor air quality within the salon.” It will also give away ventilation systems to the first 10 businesses that agree to become “healthy” salons. 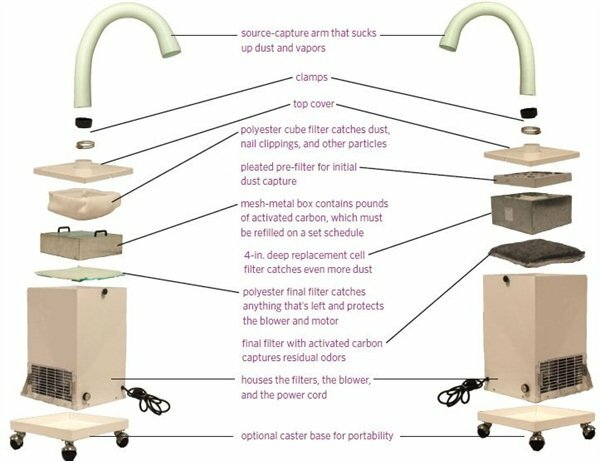 In King County (home to Seattle), Wash., the Local Hazardous Waste Management Program (LHWMP) instituted a voucher program that reimburses nail salons up to 50% of the purchase price (up to $500 lifetime) for items that lower nail tech exposure to dust and vapors, such as nitrile gloves, N95 masks, and metal cans with tight-fitting lids. “It was determined from studying some incentive programs in the country that financial assistance provided businesses with the incentive they needed to change procedures,” says Laurie Foster, nail salon project coordinator for the LHWMP. Fifty-three nail salons have used the voucher program since 2008. (It is funded by residential and commercial solid waste and utility ratepayers and by residents and businesses that take their solid waste to a transfer station or landfill.) “People from all over the country have contacted me regarding the healthy nail salon program,” Foster says. Convinced yet? If so, we’ve done quite a bit of your research for you so you know exactly what to look for in a ventilation system and how to beat some common obstacles that keep nail techs from installing proper ventilation. Setting aside for a moment money, space, and other concerns, what does the ideal nail salon ventilation set-up look like? It’s a three-part system that takes into account the breathing zone, the entire room, and the entire building in which the salon is housed. > Pulls dust and vapors away from the nail tech and into a filter before she breathes them in. > Uses the adsorption powers of several inches of activated carbon for vapors. > May use a third stage filter for additional contaminant removal. Acrylics: Vapors from acrylic monomer and acetone are your main concerns. 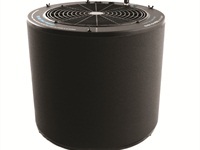 Get a source-capture system with ­several inches of activated carbon. Gels: Dust from filing off gels is your main concern. A filter that removes particles down to the micron level is ideal. Natural nails: Vapors from acetone and polish are your main concern. The go-to is the same choice as for acrylic-dominant salons: a system with several inches of activated carbon. All of the above: Get one with several inches of activated carbon. Confirm with the manufacturer that it also has a dust filter in place. > Because source capture is not 100% effective, a whole salon room air purifier is also necessary. 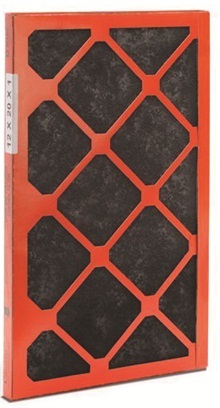 > Increased dust holding capacity compared to a residential HVAC filter. be retrofitted into your existing HVAC system, replacing the existing filter.